Here at Long Lane Honey Bee Farms, we are a family business working hard to help more people discover and enjoy keeping honey bees. We manufacture beehives and sell everything related to beekeeping. Our busiest season is from November-July. So if you are planning on purchasing hives (woodenware) then or now as the demand in late winter and early spring is overwhelming. Our Winter-Bee-Kinds not only help to feed bees in the winter with our proprietary recipe, but also provide upper insulation from the cold and ventilation which is so critical to winter survival. Watch our video demonstrating the winter-bee-kind on a hive during the winter. 2. Use locally produced queens. (We raise and sell from our own survival stock). 4. Hive inspection every 2 weeks, especially for monitoring the queen. 5. Yearly requeening is a must! July-September proves to be the most strategic time to requeen so that the queen is laying strong going into and coming out of winter, and the new queen can lay well in the fall to produce lots of young bees who should overwinter better than older bees. Okay, so those are a handful of our particular philosophy of beekeeping. Now, let's talk about getting your hives ready for another winter. What should you do? First, take one of our classes, "Getting Your Bees Through The Winter". We will train you how to reduce your worn out summer bees and start raising healthy mite free bees in the fall to be your spring bees after winter. Winter is a nervous time for beekeepers. 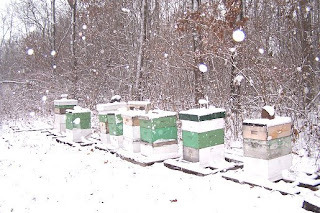 With every snow, and blast of cold, north wind, we wonder and worry how our bees are doing. Months of cold, winds, snow, rain, fog and clouds causes us to fret over our bees' well-being. In December, most of us place our ear against the outside of the hive and give a gentle tap to see if they are still buzzing, and usually they are. It is rare for a hive to die in December or even in January. The fact is, most hives that die do not even die in February. They die in March, when they have exhausted their food supply and have few to forage the early nectar on the occasional warm days. And by March varroa destruction (mites) have spread viruses throughout the colony causing the bees die several months sooner than normal. So what can we do to help our bees make it through winter? There is no plan that ensure 100% survival. Bees are livestock. Things can just go bad. But a few things can help. Typically, most consider winter preparations consists of the following: 1) Put on a mouse guard at the entrance. 2) Lift the hive and see if it has enough stored honey by how heavy it is. 3) Wrap the hive with some sort of insulation or roofing paper. 4) We build a wind break. 5) We treat for mites and nosema. 1) Beekeeper failed to control varroa mites. 2) Queenlessness. Your hive is most certain to die if your queen is weak or gone going into winter. 3) Winter Condensation. If you seal up your hive too tight, you might increase the overall condensation within the hive and cause this cold water to constantly drip onto the cluster and eventually kill your hive. 4) Keeping stored honey next to the winter cluster. 3) Examine the amount of stored honey and be sure your bees have plenty. Most beekeepers in the north lift the back of the hive and hope it feels like there is 70 pounds of stored honey. 70 pounds is the approximate equivalent of some stored honey in the bottom deep, and a lot more stored in the top deep hive body. 4) If your hive is short on stored honey, FEED! Feed 2:1 sugar water in the fall. Use our Burns Bees Feeding System in the fall to prevent robbing. Robbing is more of a problem during the fall dearth. 5) Make sure that your hive has some sort of upper ventilation. It does not have to be much but something. We make our inner covers with ventilation slots. And we leave our screen bottom boards open all winter. 6) Use good mouse guards, either metal or wooden entrance reducers to keep mice out. 7) Treat the hives 3 weeks in a row with powdered sugar for mite control in the summer and fall. 8) If wrapping hives, be sure to allow upper ventilation. 9) Combine weak hives with strong ones. Most of the small swarms you caught are not going to winter well unless you caught them in May or June. 10) Use our Winter-Bee-Kind upper feeding/insulation and vent winter feeding system. Click here for more info on our Winter-Bee-Kind. Do not feel like a failure if you have worked hard to build up your numbers, but now you have to slice your hive count in half by combining hives. Combining ten hives into 5 which survive the winter is better than having 8 out of 10 die out. Much can be said about preparing a hive for winter, but the hive that has the best chance of surviving the winter will be the hive that was very strong all year and has a young queen. Remember, a strong hive is more apt to be pest and disease free, thus overwintering much better because it does not have viruses caused by mites. No matter how much you wrap your hive, medicate your bees and build a wind break, nothing will do much to improve a weak hive overwintering well especially if they have viruses. Only strong hives overwinter well enough to explode in the spring. 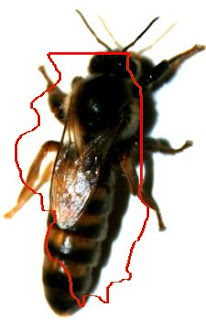 Weak hives that do survive the winter usually are not impressive the following year, unless requeened soon in the spring. I hope this lesson will motivate you to take advantage of the last few weeks of decent weather and tighten up your hives, feed them and make sure they are ready for winter. We are excited about beekeeping. The crises of the decline in honey bees is still with us. Every year we help so many jump into beekeeping for the first time. This is exciting to us because bees play such an important role in our food supply.